We have recently launched The Log Furniture Guide website, which will serve shoppers as a resource for all information that is log furniture. The site is still being populated but it will ultimately include information about log furniture construction and manufacturing, the various wood and log types used in the furniture, online and brick and mortar retailers, as well as a forum for discussions related to log furniture. Please visit our site now and give us feed back on what you think. We just added perhaps our most unique pieces of rustic furniture – the Oak and Osage Orange Log Rocking Chair. This chair is meticulously handcrafted in America and is designed for comfort. It features a hand-sanded and stain-rubbed ontoured solid Oak seat with wrap around blocks. The rest of the rocking chair is constructed from hand-carved Osage Orange logs, which results in a uniquely charactered and natural contrasting style. Each one of the Oak and Osage Orange Log Rocking chairs will have a one-if-a-kind look and they are crafted to last a lifetime. 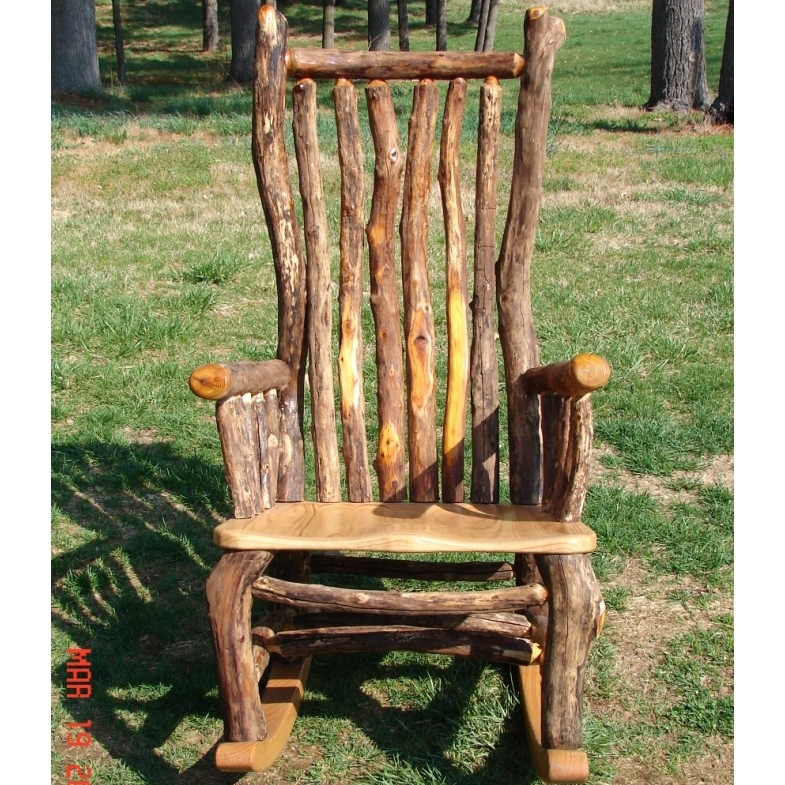 Buy this rustic log rocking chair and other fine rustic furniture and decor at Log Cabin Rustics. All of our aspen furniture manufacturers handcraft their pieces and back them with a lifetime warranty, so you are sure to enjoy them for years. Since no two aspen logs are alike, every piece of our aspen furniture will be unique and have character all its own. Our Aspen furniture manufacturers all use a sustainable and environmentally friendly practice of harvesting only dead-standing aspen trees. Aspen is a strong, even-grained and durable hardwood that is ideal for constructing character-rich rustic furniture. Visit Log Cabin Rustics to see our selection of premium American-made Aspen furniture and other fine quality rustic furniture. Log Cabin Rustics is pleased to announce the launching of a new line of Amish furniture by Montana Woodworks. This line of handcrafted American-made Lodgepole Pine log furniture includes rustic pieces for every room in the house as well as outdoor log furniture. Montana Woodworks sustainably harvests “dead standing” Lodgepole Pine from the Kootenai National Forest and manually carries the cut logs to the road to ensure the surrounding natural environment is not damaged. After the drying process is complete, the Amish furniture manufacturing process can begin. Every log is hand-peeled with a drawknife, and this step removes the outer bark, while leaving the inner bark (cambium) in tact. The resulting log now has stunning contrast with rich texture. 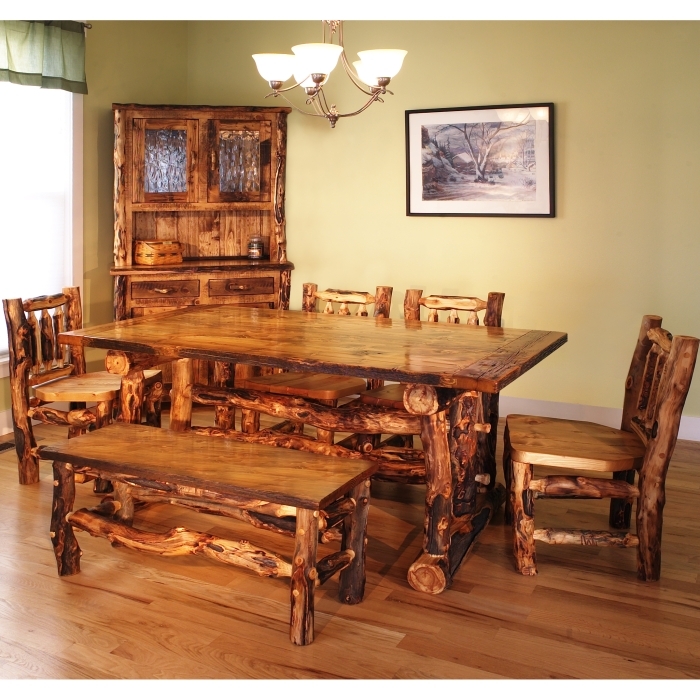 Each piece of Montana Woodworks Amish Furniture is designed to be unique and a one-of-a-kind, with a look that is reminiscent of Grand Lodges of the Rockies from the early 1900s. This Amish Furniture is assembled using round mortise and tenon joinery that provides a strong and sturdy construction intended to last a lifetime and more. The manufacturer offers a 20 year warranty on materials and workmanship on all of their products.